Scientists working in Myanmar have uncovered a nearly 100-million-year-old baby snake encased in amber. Dating back to the Late Cretaceous, it’s the oldest known baby snake in the fossil record, and the first snake known to have lived in a forested environment. Over 2,900 species of snake exist in the world, and they can be found on every continent except Antarctica. These legless reptiles first emerged during the Cretaceous period, and they wasted little time, slithering to virtually every part of the planet by around 100 million years ago. 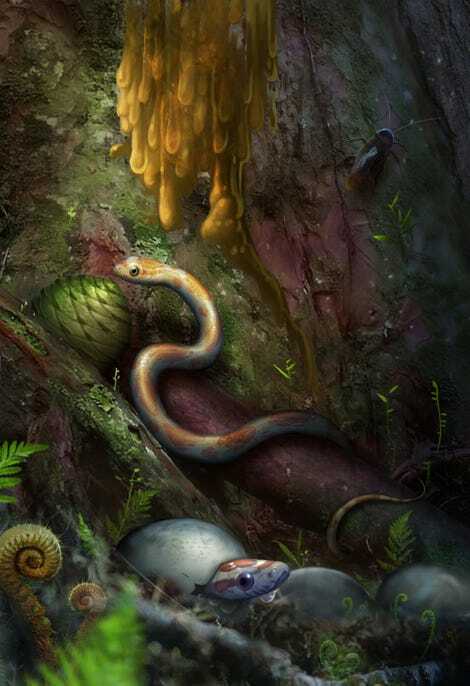 The discovery of a baby snake fossilised in amber shows that early snakes had spread beyond swamps and sea shores, finding their way into forested environments. What’s more, these ancient snakes bore a startling resemblance to those living today—a classic case of evolution not having to fix something that ain’t broke. These findings were published today in Science Advances. Artist’s conception of Xiaophis myanmarensis. This remarkable fossil, along with a second fossilised snake specimen, were discovered at the Angbamo site in Myanmar’s Kachin Province. The second fossilised snake, also preserved in amber, only consisted of bits of scales and skin, but these remnants were clearly snake-like in appearance. Together, the fossils are offering fresh insights into the evolution of snakes and their global reach by the time of the Late Cretaceous. The second fossil, dubbed DIP-V-15104, contains the discarded skin of a larger individual, featuring both dark and light patterns. This wasn’t enough for the researchers to identify the species. Detailed x-ray view of the baby snake. The baby snake, which was just a hatchling when it died, measured 47.55 mm (1.8 inches) in length, but it’s missing its head (for reasons unknown). The researchers were able to document nearly 100 vertebrae, along with bits of rib and other anatomy. It’s similar to other Cretaceous snakes, yet unique enough to warrant the designation of a new species, Xiaophis myanmarensis, where “Xiao” is the Chinese word for “dawn,” “ophis” meaning “snake” in Greek, and “myanmarensis” for Myanmar. 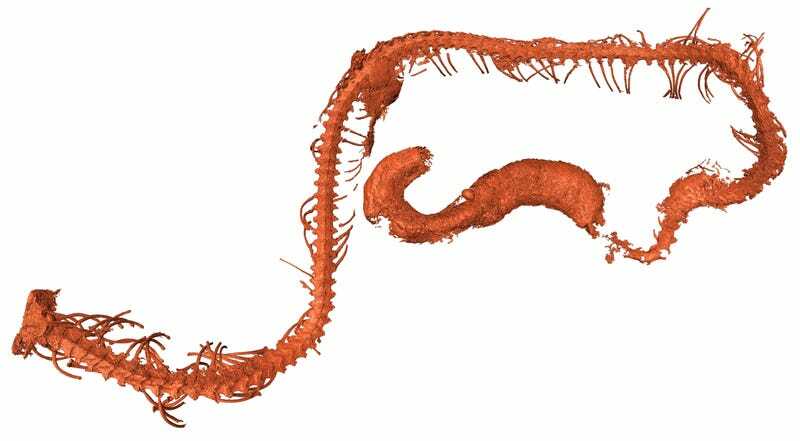 Snakes have been found preserved in amber before, but this is the first time palaeontologists have discovered a baby snake fossilised in this way. Xiaophis myanmarensis is comparable in size and shape to some baby snakes observed today, like the Asian pipe snake. This fossil provides the earliest direct evidence showing that the growth patterns of snakes have remained unchanged for the past 100 million years. These two snakes are also the first Mesozoic snakes known to have lived in a forest environment, “indicating greater ecological diversity among early snakes than previously thought,” write the researchers in the study. Both fossils were found next to remnants of insects and fragments of plant materials associated with forest floors.